Between Many Tricks and this blog, I spend a lot of time in browsers. Most of the time, I use Safari, but I do occasionally work in Chrome and Firefox, too—most often to check how a page looks or functions. 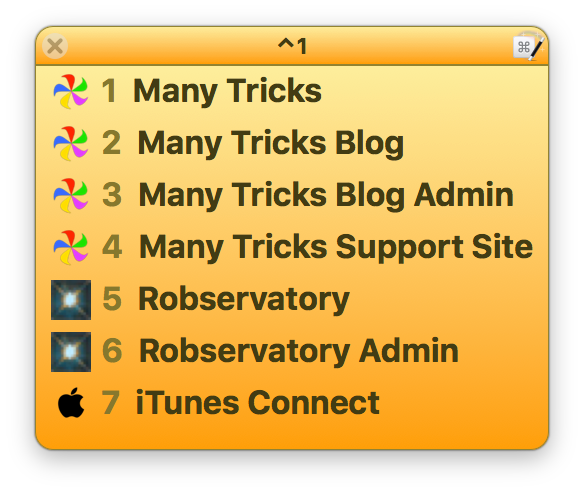 I wanted a way to open a limited number of URLs in either Safari (if that’s what I was in, or if I wasn’t in a browser), or in the frontmost browser, if that browser were frontmost. I could just create the subset as bookmarks in each browser, but if I wanted to add or remove a page from the list, I’d have to do so multiple times. In the end, I came up with a set of Keyboard Maestro macros that do exactly what I want. I access my short list of multi-browser URLs via Keyboard Maestro’s pop-up palette, as seen at right. This appears when I press ⌃1; after that, a single digit opens the desired URL. But how does it know whether to open the URL in Safari or one of the other browsers? It takes one helper macro, then one macro for each URL that I want to open in this manner. 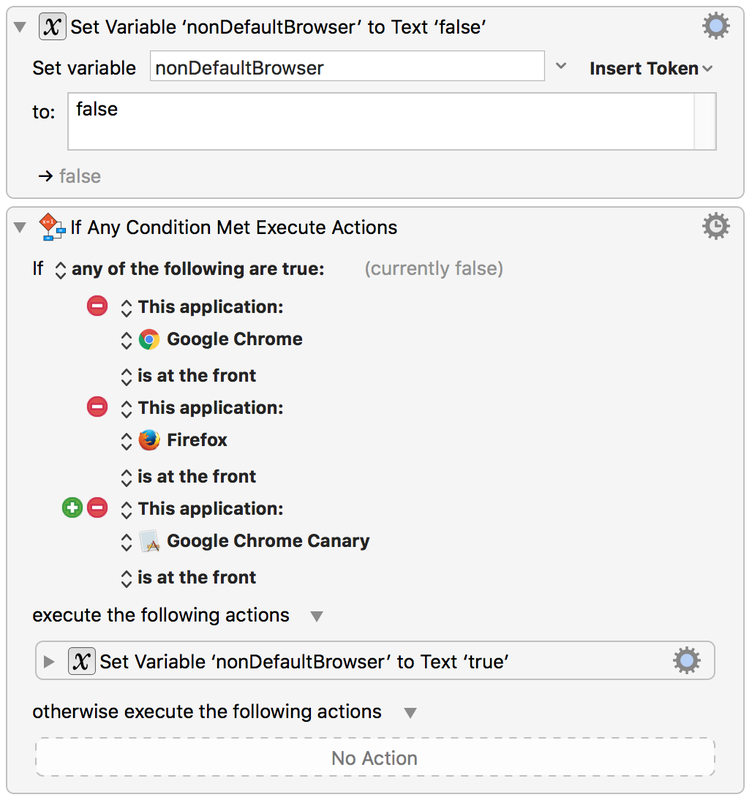 The first step sets the nonDefaultBrowser variable to false. The if statement then checks to see if the frontmost app is one of my defined non-default browsers; if it is, it changes the variable’s value to true. Otherwise, nothing happens, meaning the value would be false. If I want to change my list of non-default browsers, I just add or remove them from the list in the if statement. In Keyboard Maestro, variables are peristent—once they’re created, they continue to exist until deleted. 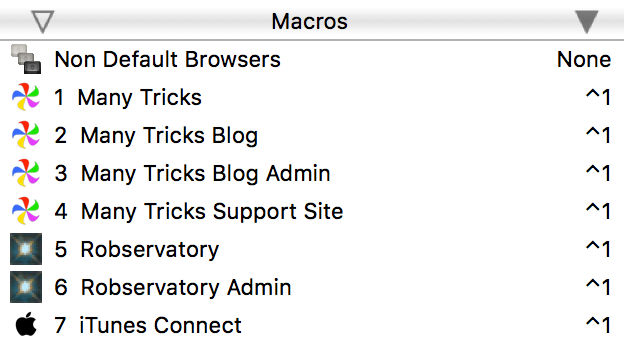 When the macro runs, I’ll have a variable I can check to see if the frontmost app is one of my non-default browsers, or something else. The real key to making this work is that Keyboard Maestro lets you execute one macro from another, so all I have to do is run the Non Default Browsers macro before opening a URL. When the nonDefaultBrowser variable is true, that means that I’m in one of the non-default browsers. In that case, the macro sends a ⌘L (which selects the URL bar in Chrome, Firefox, and Safari), pastes the URL, and then sends the Return key. 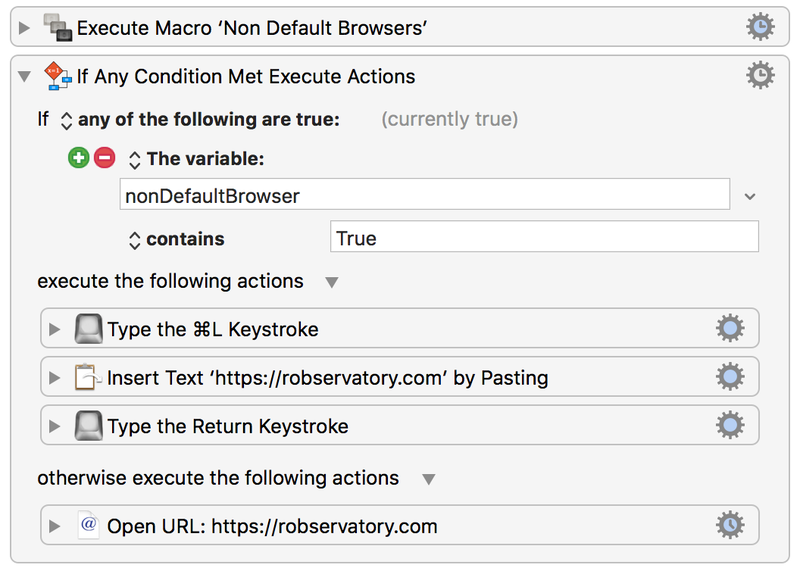 This setup works amazingly well for me—and the technique of keeping a conditional in one macro, checked by one or more other macros, will probably prove useful in future macros.